This post was written by Cole Ramirz as a guest post for my blog! I know SO MANY mamas are pregnant with twins and it can be overwhelming to know what is actually needed…enjoy her insight on this topic! With each baby, I have developed more of a LESS IS MORE attitude. My husband hates clutter (and really, so do I), so with each new child I’ve felt some pressure to really pare down baby items to just the necessities. But of course, we have twins. What does this mean in terms of STUFF? we thought. Do we need two of everything? Two cribs, two swings, two pack and plays? Double the clothes, the diapers, the bottles, and the wipes? OH THE FEAR IN MY HUSBAND’S EYES. She’s not going to buy two of those huge jumparoos is she? The strategy I decided on was to buy as little as possible before the babies came and then add things as I needed them once the twins arrived. This has served us well and it is the advice I would give anyone else having twins. Wait until the babies arrive and then see what you need. But of course there are other factors at play – like baby showers. If these are your first babies and you are having a shower, you will want to put certain items on your baby registry. Or if you are a member of a Facebook swap group and see a good deal come up, you may want to buy something in advance. For those reason, I’m making a list of the baby items we have found necessary for twins – and a few commentaries on the things that aren’t. Many twin moms put their babies in the same crib at the beginning. I did that too. I was actually secretly hoping I could keep them that way forever. From the very beginning they liked to sleep touching, so they would wiggle their way over to each other before falling asleep. TOO CUTE FOR WORDS. Unfortunately, at some point your twins will start rolling, and if you value sleep like I do, you will separate them into two cribs. You only need one room, but you do need two cribs. On a related note, I am undecided about whether you need two pack and plays. My twins are 7 months old and still nap fine in the same pack and play when we are on the go. I assume there is a point where this will stop, but I am not sure if that time will come before they are old enough to just skip naps on occasion. For now, just buy one pack and play. You obviously need two car seats. Keep in mind that you DO NOT need an infant car seat. I received one at my baby shower when I was pregnant with my first, so I’ve taken advantage of it, but if you are trying to save money (and space), just skip that step and buy a good convertible car seat. But like I said, I already had one infant car seat and I found another nearly new one on Close 5 for $30.00, so I decided to go that route. If you have two infant car seats, you will want a double snap and go stroller. These strollers allow you to remove the infant car seats from your car and snap them directly into the stroller. I used this stroller ALL THE TIME until around 4-5 months. At that point, you can sell your double snap and go and trade it in for a different sort of double stroller (I use a cheapo umbrella stroller). I have heard some people make due with a single rocker in the baby room, but there is no chance I could have nursed my twins (or even bottle fed my twins) without a loveseat in their room. In the beginning (before I felt comfortable lifting both babies at once) I needed a place to put one baby down while I got the other out of the crib to feed. Now, at 7 months, a single chair simply is not big enough to tandem nurse them in. If you do not have a couch in their room, you will either need to nurse somewhere else in the house (how inconvenient at night!) or you will need someone to help you get the babies situated (don’t do that to your husband!). I did not use a nursing pillow with my first two babies, so I wasn’t sure if I would need one for my twins. Turns out it is my most used baby item. I have the My Brest Friend Twin Deluxe Nursing Pillow, but I’m not attached to that one over any others – I was just able to find one in good used condition for $20.00 so I bought it. It is not without it’s faults, but it gets the job done and I still use it occasionally at 7 months. If you are planning to nurse your twins, YOU WILL NEED A TWIN NURSING PILLOW. This is an example of an item I held off on buying until after the twins arrived and started eating food. I wasn’t sure if I would be able to get away with just one high chair or not. You definitely need two high chairs. And if your house is as small as mine, you definitely need two STACKABLE high chairs. I bought these ones from Ikea for $20.00 each. It is my opinion that you DO NOT need a twin baby carrier. Someone gave me the Weego as a gift and although I did use it a few times, I used my single Ergo far more often. My twins grew out of the Weego at 4 months anyway, so it really was kind of a waste. When I was pregnant with my twins, I found it helpful to picture myself doing various errands and think about what items I would need for that particular situation. For example, how will I arrange all 4 kids on a trip to Target? Those trips require a carrier because there is only room for one baby in the seat of the cart (unless you want to push around one of those RIDICULOUS Cadillac target carts, which to my kids’ disappointment I will never do. Come on. That’s what dads are for). When the twins were newborns, I kept one baby in their infant car seat and put that in the big part of the cart and wore one in the Ergo. Now that they are bigger, I put one baby in the seat part of the cart and carry one in the Ergo. My other two (2 and almost 4) either hop on to the side of the cart or they walk. Think about yourself going through your daily and weekly schedule. You probably need a carrier to get a lot of what you have to do done. Let me clarify: you DO NOT need two bouncers, two swings, and two rock and plays. You just need two places to put a newborn baby down – total. That might mean one bouncer and one swing or two bouncers. I did have two bumbos and I do use both for baths sometimes, but other than that, no single baby seat item need be duplicated. I’m cheating a little here because we actually haven’t gotten much use out of this yet – neither baby is crawling. But you’d better bet this thing is going to get tons of use once that happens. We did not use a play pen for our first two children. With one baby, there just wasn’t really a need. If we were inside I felt confident in my ability to keep my eye on the crawler and if we were outside or in some other kind of situation where crawling wasn’t safe, I could just hold the baby. With two, this is less realistic. I need to be able to contain them at certain times during the day – certainly not all day, but in moments where I simply cannot be running in two directions or holding both babies. To be clear: a play pen is different than a pack and play because it is larger (room for twins) and has a hard bottom (so it’s clearly not for sleeping). I bought a super cute antique wood one on a Facebook swap group, but I have a few friends who have and love this portable one. 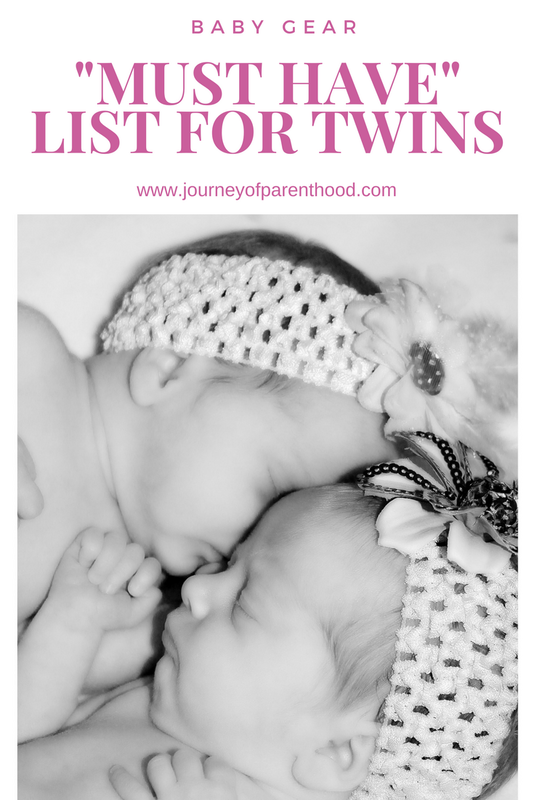 This is certainly not a complete must have list, and each twin mom will find that different items are absolutely necessary to their life. But given my experience, this is a good list to start from. Focus on only purchasing what you really think you’ll need, and you’ll avoid turning your entire house into one big baby playroom.